Introducing Scinex SW20 highest quality Smartwatch. Now you can easily make and answer phone calls whenever you like even when your phone isn't nearby. You can read and reply to SMS messages (Android only), receive notifications like WhatsApp and Emails, and stream your favorite music straight from your smartphone device. Taking photos and videos are easy, and with a 16GB memory capacity, you will have plenty of space for them all. Use the watch to connect to your smartphone. Please note that SMS messages, emails, and other notifications will only work when the watch is paired with a smartphone device and Fundo Wear app is installed. - Transfer all your contacts, stream music, and choose your custom theme. - Take photos, videos and record audio directly from your watch. - Drag music to your SW20 and listen to your playlist. - 16 GB Memory capacity for all your data such as photos and videos. - Set your Alarm, create Calendar events, and use a built-in Calculator. - Pedometer feature and Sleep monitoring to check the time and quality of your sleep/activity. - Battery life holds for 2 days with a normal use. For everywhere you go. ! The perfect companion to keep you organized and productive all day long. Receive notifications for emails, SMS messages, and incoming phone calls (prompting you to take action on your smartphone), as well as alerts for Facebook, Twitter, WhatsApp, LinkedIn, Snap, Slack, weather forecasts, and other mobile apps. Look as Good as You Feel: With a range of colors and options, Dress to impress every day. The SW20 is designed to be worn as an extension of your personal style. Weighing only 2oz(68g), and with a stunning, modest 1.5" Touch Screen display, the SW20 can be worn all day long. Will work with Samsung Galaxy, LG, IOS iPhone, Sony, and Nexus. For all the extras you need: Scinex SW20 16GB Smartwatch comes with a Camera for videos and photos, music player, and even a memory slot that will allow you to increase the 16GB memory size up to 32GB. Track walks and runs with the pedometer feature that can be displayed directly from the app. This high quality watch has a unique design that will look good for both men and women, enable you to download more watch faces with an Android phone, will work with iPhone/Android and any other mobile device. It will do everything a modern smartwach has to offer. All Functions like Push Notifications, Remote capture, Anti-lost (for locating your phone when lost) are supported. Enjoy 12 hours of battery life so you never miss a moment. Satisfaction Guaranteed: Buy with confidence. Scinex offers a 30-day refund policy, and 12-month replacement warranty. 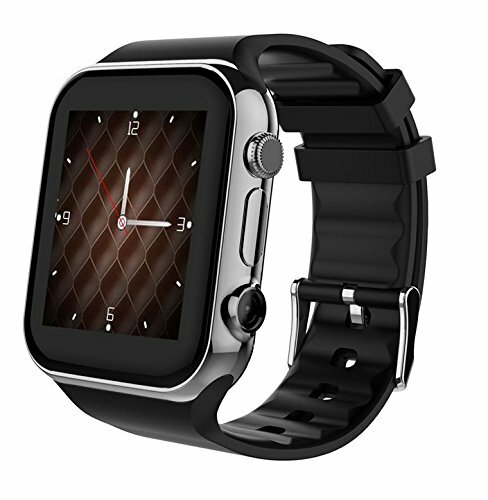 Note: The Watch only support 2G network: GSM 850/900/1800/1900 Stunning simple. If you have any questions about this product by Scinex, contact us by completing and submitting the form below. If you are looking for a specif part number, please include it with your message.